Today is the annual Christmas Bird Count, and our backyard is once again on the list of spots to visit. The cardinals were here briefly in early November, but have not made their return to stay as yet. It's normally about Christmas when that happens, so it could be any time. Last year they came on the actual day of the bird count - how did they know? Yesterday's snow should make the feeders busy today. When the representative called yesterday she mentioned that Baltimore Orioles have been spotted in Amherst, which is very unusual. I am hopeful that we will get to see one at our feeders. P.E.I. is also reporting new feathered residents: Snowy Owls. This makes for great opportunities for birders in our area to see species not normally spotted here. The colour choice in this one really makes the spikes spin around the perimeter. Beautiful work, Clara; we thank you for sharing. And a P.S. on the bird count: we received a call that the cardinals were spotted in our back yard. Yah! 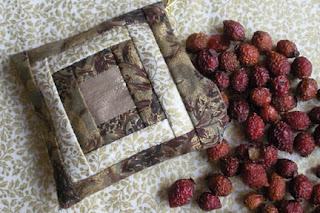 Here’s a quick and simple idea that can be used to dress up a package, a tree, or as a sachet in a room or drawer. This one is made from cotton and lamé and filled with scented rose hips; hung on hooks or doorknobs, it will impart a Christmassy scent throughout your house. I buy the rose hips every year at Mrs. Pugsley’s Emporium, located on Victoria Street in Amherst. These rose hips are one of the few scented things that don’t make me sneeze! 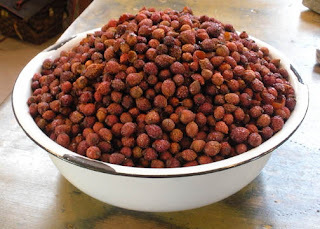 At Mrs. Pugsley, the rose hips are kept in a big enamel bowl on the front counter. They are scooped out and sold by the pound. The block is constructed in the manner of a Courthouse Steps Log Cabin. 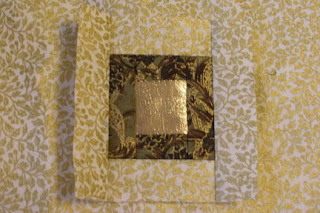 Sew a green 1” strip to top and bottom of 1-1/2” gold centre square. Trim ends. Press. 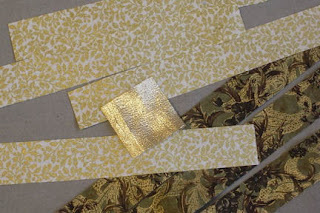 Sew green 1” strips to both sides of gold centre. Trim and press as before. Add cream strips next in same order - top/bottom then sides, trimming square after each addition. 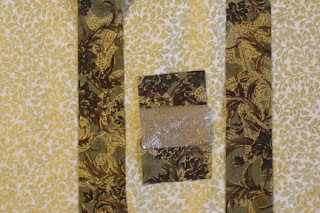 Continue in this manner, adding the second strip of green to the outside in the same order as before. Trim ends even and press block. Lay block face down on backing. 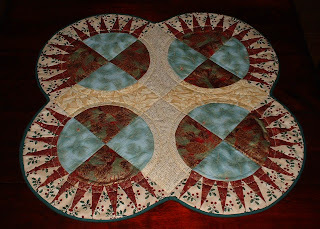 Sew together on 3 sides, leaving 3” opening on 4th side to turn. Turn right side out. Fill with rose hips. Hand sew opening closed. Tie cord into a loop. 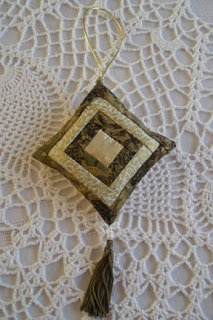 Attach tassel and hanging loop to opposite corners of the block with a few hand stitches. I used a tassel cut from a length of braid. Look what arrived in the email this morning! Sharon from Oxford, N.S. 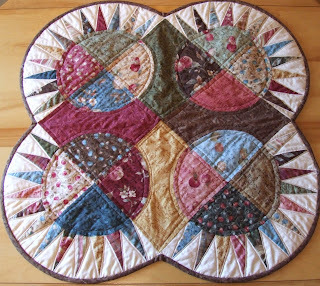 attended a fall workshop on Maritime Beauties and wowed us all that day when we learned she was a beginning quilter. She zoomed right through this, encountering no obstacles to slow her down. Sharon writes that she is working now on another, in blues and golds. Won't that be gorgeous? 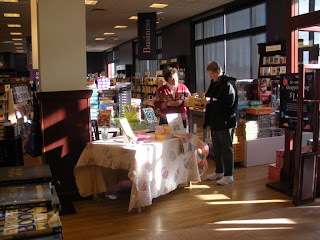 Moncton turned on the sunshine in full force yesterday for the book signing. It was a great day, first at Chapters and then at Coles in Champlain Place. Moncton has a reputation for being a very friendly city, and lived up to that yesterday as many folks stopped to chat and share quilt stories. Several members of the Moncton Quilt Guild arrived including Jerri who brought along her latest Maritime Beauty to show. We had a hard time getting a good picture in all that sunshine; in person the colours are lush shades of lavender, mauve and purple: very, very pretty. 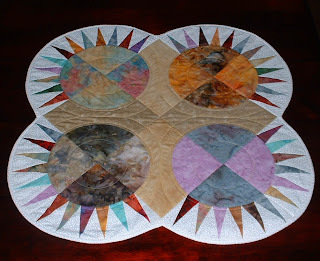 It's always a treat to see quilts and I appreciate Jerri's thoughtfulness in bringing it along. If you have yet to pick up your copy of Canadian Heritage Quilting, signed copies are available at most of the Chapters/Coles stores I have visited as well as at Mrs. Pugsley's Emporium in Amherst where you can still enter your name to win one of the quilts shown in the book. Those outside the local area perhaps can connect with Diane at one of her appearances. If you'd like a copy mailed, I'd be pleased to do that; please email for postage rates. Nothing quilty planned for today as youngest has two band concerts at the high school. We will sit back and (proudly) be entertained. The book signings last Saturday in Halifax were very busy, and a big thank you to all who turned out to make the day a success. It was a wonderful time to connect with friends and family I hadn't seen for awhile and also to meet up with quilters. Folks from several area Guilds stopped by to say hello as well as Bev Crouse from The Quilter's Net. One of the best parts of the day was meeting up with Jane, whom I had "met" virtually on a Cyberquilters list. She was so helpful in supplying precise driving directions to both the Halifax bookstore locations; a great time (and frustration) saver. This coming Saturday, December 6th, I will be in Dieppe at the Coles and Chapters stores: 12-2 at Chapters and 3-5 at Coles in Champlain Place. If you happen to be in the Moncton area on Saturday, I do hope you will drop in to say hi. If you are in Halifax this Saturday, November 29th, I will be around signing copies of Canadian Heritage Quilting. From 12-2, look for me at Coles in the Hfx Shopping Centre and from 3-5 at Chapters in Bayers Lake. Those of you unable to get out to shop may enjoy doing so from the comfort of your computer chair. 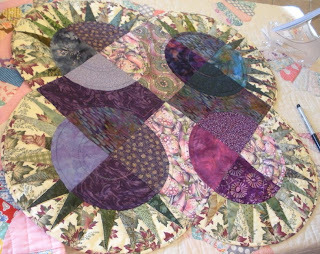 There is a new site called Quilter’s Net, which is the brainchild of Nova Scotia quilter Bev Crouse. 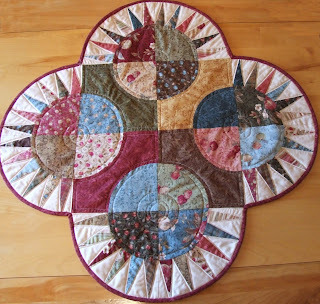 Bev writes, "The Quilters’ Net showcases quality handmade Canadian quilts and quilted accessories, all in one convenient internet market, complete with shopping basket. 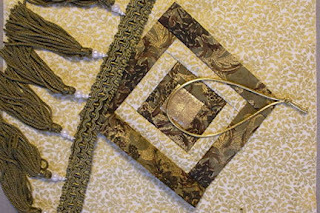 Our products have all been individually crafted by skilled Canadian Quilters and, when purchased, will be shipped directly from the Quilter, to you." There are some beautiful pieces, including Christmas designs, and more added regularly as the site grows. Be sure to check back often. Another interesting spot is Truly Canadian Made. This site showcases a variety of hand made products . Here you will find "the webshops of artists and artisans, galleries and cooperatives from across Canada displaying handmade art: from glowing glasswork, to finely worked gold, silver, and gemstone jewellery. Decorate your world with unique pottery, paintings, drawings, photos, graphic art, woodcraft, sculpture, and metal art. Relax with colorful textiles, quilts and knits, luxurious soap and candles, and gourmet food and drink. Worldclass Art - Truly Canadian Made." I do hope you will be able to drop by on Saturday to say hi. 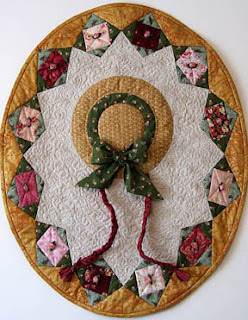 I am looking forward to meeting up with a lot of Mayflower Quilt Guild members. And...for those of you doing your shopping here in Amherst, be sure to drop into Mrs. Pugsley's Emporium and put your name in to win the Flannel Nap Quilt shown in the book. Because of last week's snow, we decided to run the draw a little longer. There are also signed copies of Canadian Heritage Quilting both there and across the way at Pugsley's Pharmacy. I've been receiving lots of pictures of completed Maritime Beauty workshop projects and am gradually getting them posted to the Sew and Tell page of my website. There are more pictures coming soon, so please check back to see the wonderful display of colours chosen by the participants. Don't forget to refresh your browser each visit to see the updates. This one came from Chris; how lovely to see it all in Christmas colours. Great timing, as we begin our Christmas decorating. It was fun to see how many of these same prints Chris used that I have in my own stash! 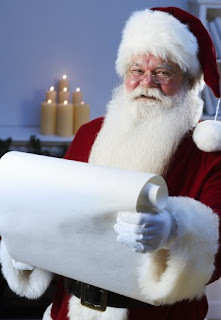 ...Christmas! Our first snow arrived with a vengeance last evening and caused a bit of havoc on the roads. It is Christmas card pretty outside. The timing is rather appropriate, as tomorrow night is Amhert's light up festivities. We will attend the ceremony in Victoria Park and the carol sing at the Baptist Church to hear our youngest play in the school band. Afterwards, we will head to Dayle's Department Store for their annual light up, which is nothing short of spectacular. I dropped in yesterday to peek at their decorations and Jackie was busy working her usual magic. Saturday is the Santa Claus parade, and again our youngest will be marching and drumming with the school band. 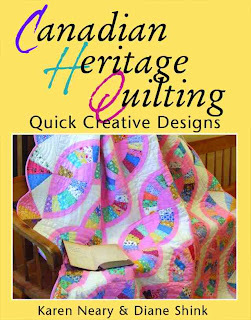 I will be at Coles Bookstore in the Amherst Centre Mall on Saturday from 2-4 pm, signing copies of Canadian Heritage Quilting. If you happen to be in town, please drop by to say hello. And what a blast it was! We launched Canadian Heritage Quilting in fine style Friday night. I can't begin to thank everyone enough (most particularly Beth Munroe) for making this such a memorable occasion. The fun started Friday afternoon with an anonymous delivery of flowers, left quietly on my doorstep. Hmmm...now who could that be...? There were many emails and phone calls from well wishers throughout the day as well. At 7 pm, the doors opened at Mrs. Pugsley's Emporium. The Old Clock Tower looked so inviting; on approach, you could see the quilts hanging in the windows. Beth Munroe, owner of Mrs. Pugsley's, is nothing short of amazing. The creative touches she adds never fail to astound and delight. She came up with the idea of having cookies made in the shape of a quilt block from the book's cover, and generously distributed these to all in attendance. The decorated cookies from Noelle’s Custom Cookies were incredible. Noelle even custom-matched the frosting colours to fabric samples from Gram's Baptist Fans, the quilt gracing the book cover. How cool is that? Needless to say, the cookies were a huge hit and the recipients went home with a delicious piece of edible art. We even had a delightful moment to oohh and aahh when Bernice arrived with her latest version of the Maritime Beauty, this one done in Christmas colours. Alie Cameron from Antigonish also helped in this capacity, but was unable to attend due to health issues. Her good wishes were delivered via the telephone. Thank you to all who attended, and a special thank you to Beth. We had intended to take the quilts down after the weekend, but decided that perhaps they could stay a bit longer. This coming Saturday (Nov 22nd) is the Christmas Parade in Amherst, so if you are in town that day and would like to see the quilts in this spectacular setting, you are welcome to stop in at 50 Victoria Street. Mrs. Pugsley's Emporium is open afternoons from 1-4:30. Oh...and the flowers? They turned out to be from the Moore family. Thanks Charlene and Drew for your thoughtfulness. It was so much fun at Mrs. Pugsley's Emporium last night! I will post some pictures shortly. We're doing the same thing again today, from 1-4:30 pm. You won't believe the cookies Mrs. P has...just incredible. Too much fun! Beth Munroe, owner of Mrs. Pugsley’s, has spent a great deal of time and energy putting together this event. I will be there Friday, Nov 14th from 7-9 pm and again the following (Saturday) afternoon from 1- 4:30. I sincerely hope you can join us. Please email if you require further information. If you are unable to attend, the rest of my signing schedule is posted here. Coauthor Diane Shink will have her schedule posted shortly, and that may be found here. Everyone's invited to the launch! Quilt appraiser and historian Diane Shink and I have been working on a book with Formac Publishing of Halifax. 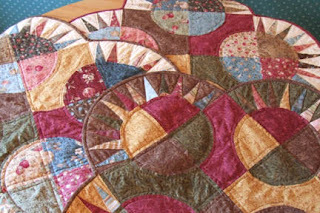 The book is a mixture of old and new; we've showcased vintage quilts from museums as well as from Diane's extensive personal collection and updated the sewing methods using today's quicker techniques. 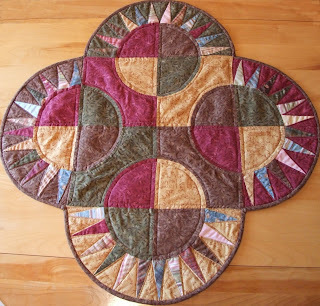 As an example, the cover quilt "Gram's Baptist Fans" features a very gentle curve. It is easily pieced by machine rather than appliquéd as our grandmothers would have done. The book contains instructions for 16 projects, ranging from postcards, to totebags, to full-sized quilts. More details to follow, both on ordering and on the big launch planned for downtown Amherst. I'll be adding that information here so please check back. Oh My...every so often something so clever and good comes along that you just have to share. 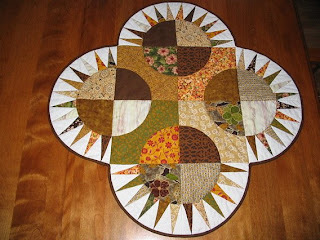 Thanks to Kathi from Kuwait for posting this on an online quilting list. This is just too much fun! Add dry ingredients to mug, mix well with a fork. Add egg,mix thoroughly. Pour in milk and oil and vanilla, mix well. Add chips, if using.Put mug in microwave, and cook for three minutes on 1000watts. Cake will rise over top of mug--do not be alarmed! Allow to cool a little; tip onto a plate if desired.Eat! And WHY is this the most dangerous cake recipe in the world? Because now we are all only five minutes away from chocolate cake any time of the day or night! Well...my quilt is, not me... I am thrilled to learn that Simply Stated: A Portrait of Anne As A Young Girl has been awarded first place in the 100 Years of Anne category in the Kindred Spaces Textile Show. This show was organized to honour the 100th anniversary of the publication of Anne of Green Gables. In addition to the $1000. 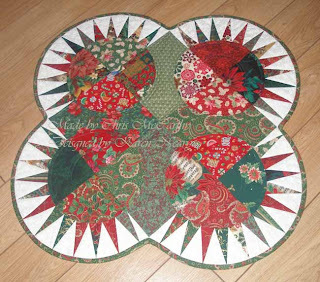 cash prize, the quilt travels to Yokohama, Japan to be exhibited in their International Quilt show, November 6 -8, 2008. (And if anyone has a couple of extra tickets to Japan just lying around, well...! Yesterday was such a fun time, gathered with a very enthusiastic group of women attending one of the Nova Scotia Fibre Fest workshops. The Ralston Room where we met was huge; it was a real treat to have so much space. We spent the day foundation piecing, sewing curved seams and making bias binding. These are the only pictures I took, and they were from the beginning of the class. Hopefully, the participants will all be sending along a picture of their finished Beauties which can be posted here. My thanks go out to the Cumberland Quilt Guild, Carol in particular, for all the work they did to organize and make the day a success. After the workshop, we all went upstairs to take in the guild's quilt show. The number of quilts, the diversity in colours and patterns, and the beautiful sanctuary of Amherst's First Baptist Church all combined to make a spectacular exhibit. It was a "wow" moment entering that space.